After communion, all in the assembly are invited to engage in silent prayer, or a thanksgiving hymn can be sung. 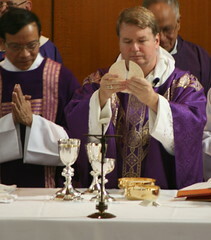 The Liturgy of the Eucharist then concludes with the Prayer After Communion. The Concluding Rites then bring our celebration of the Mass to a close, sending us forth to proclaim the gospel to the world. 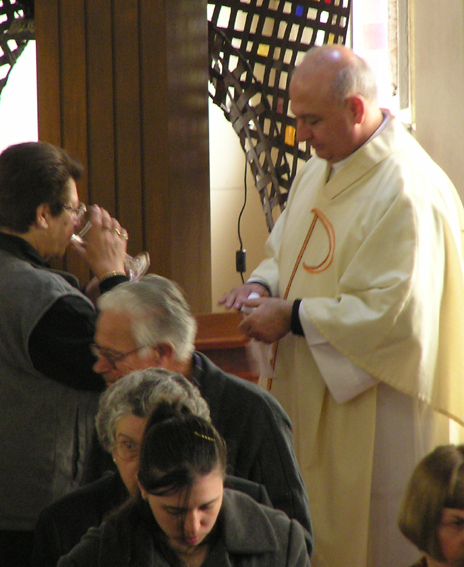 The Concluding Rites of the Mass typically include a blessing and a dismissal of the people. The dismissal contains some new forms which previously did not exist. Before the latest edition of the missal, the Latin edition had only one dismissal, “Ite, missa est.” In the new translation, this is conveyed in English as “Go forth, the Mass is ended.” The current translation guidelines, which insist on a word-for-word translation, would have resulted in this one form of the dismissal being included in the new English edition. While we are about to receive communion, the “roof” in this response has nothing to do with the roof of our mouths! Like other texts that have been revised in the new translation of the Missal, this response bears a scriptural image that has been restored in this edition. As such, when we respond to the priest’s invitation to communion, we echo the thoughts and the words of the centurion’s servant. We are not worthy to receive the body and blood of Christ in holy communion. Yet this is also a reminder and acknowledgement of the remarkable gift we receive. We are truly healed, strengthened and nourished for the Christian journey. As St Augustine once described it, we “become what we receive”, or “say ‘Amen’ to that which we are”, the body of Christ. And as Jesus explains at the end of this encounter with the centurion, God’s will is done within us because of our faith. 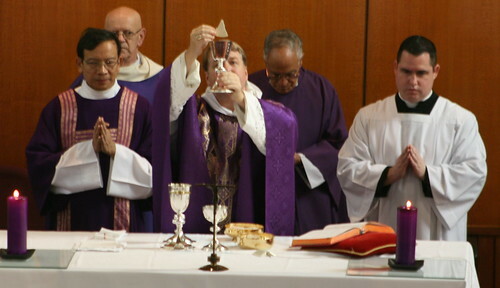 While the priest leads much of the Eucharistic Prayer on behalf of us all, there are three points where we add our own voices to this prayer of thanksgiving: the Sanctus (Holy, holy), Memorial Acclamation (“the mystery of faith…”) and the Great Amen. In the previous English translation of the Missal, we had four memorial acclamations. In the new translation, there are three. If you have looked over the revised Order of Mass, you will see similarities between the past and present translations, but notice that the most commonly used acclamation, “Christ has died, Christ is risen, Christ will come again” no longer exists. Each of the three memorial acclamations we have now corresponds with one in the Latin edition of the Missal. The former acclamation, “Christ has died…” was an additional acclamation, loosely based on the first Latin acclamation. It was unique to the English edition of the Missal. The current expectation that liturgical texts be translated according to the principle of formal equivalence (that is, a word-by-word translation as much as possible) means that there cannot be additional texts that do not exist in the Latin edition. Yet there is another difficulty with the former “Christ has died…” acclamation that should cause us to question its suitability.